Whilst many of us will instantly recognise and indeed associate the Celestron brand with astronomy, in terms of producing binoculars specifically designed for terrestrial uses, they are fairly new to the party. 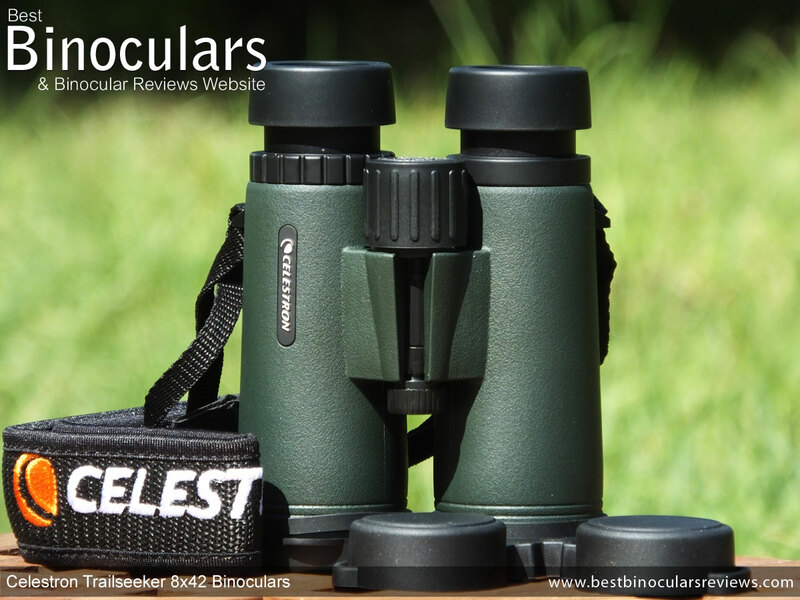 However that is not to say they are beginners in terms of being able to produce a quality instrument for looking at objects on this planet: Not that long ago, I had the pleasure of testing and reviewing the Celestron Granite 8x42 bins, that went on to win the award for for the Best Birding Binocular that year. Whilst they may have a different body design, from first impressions, these Celestron Trailseeker 8x42 binoculars remind quite a lot of the Granite's. Indeed as you will see later in the review, they share many of the same very impressive components, accessories and statistics that helped the 8x42 Granite win that award. 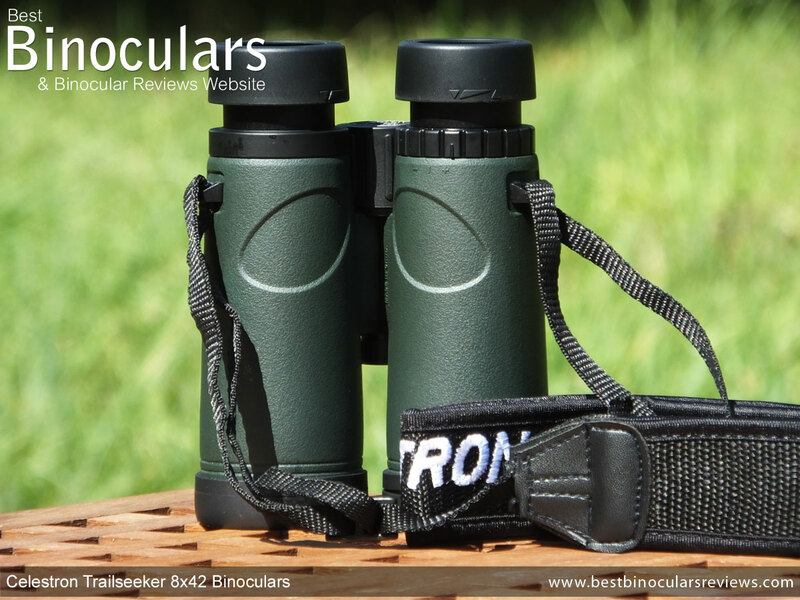 So considering that this Trailseeker binocular is much more budget focused and thus aimed at the more price conscious user, is already really impressive. For a start the central bridge that connects the two barrels is quite thin and it is positioned more towards the eye-pieces than the usual larger ones that are located more towards the center. Weight Saving: Because less material is used, the smaller, thinner bridge does have the potential to cut a few grams off the final weight of the binocular. Grip: This design leaves more of the barrels exposed which like the open-bridged bodies, gives you more surface area to hold onto for a better grip. This can really help when carrying them one handed for example. Almost all bins within this price level will have a polycarbonate plastic frame, which besides from being cheaper to manufacture do have the advantage of being lightweight, reasonably strong and will not corrode. However they rarely have that extra feel of quality that you get from an aluminium or magnesium alloy framed bino. Whilst aluminium and magnesium are still reasonably lightweight, they are both stronger than polycarbonate, but the problem is that they are also more expensive to produce and so are usually only found on higher end products. 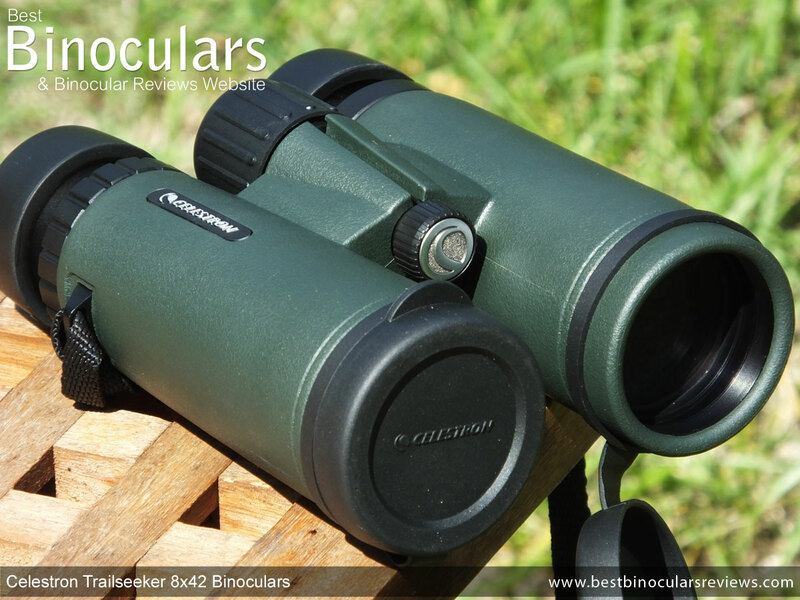 That is why I was quite surprised to discover that the Celestron Trailseeker binoculars, including this 8x42 model all use magnesium alloy frames and which most certainly lifts them a little above the crowd in their class. These Celestron Trailseeker 8x42 Binoculars are described by the company as being "fully waterproof", which does mean that the body has been fully sealed, but they do not go on to specify a recognized standard or depth. For most users this does not matter as it does mean that you can use them with confidence in even the worst weather conditions, just don't test them out in your pool! Also remember this sealed body also helps prevent even the smallest dust particles from getting into the system, which if you live in a dry area is just as important as waterproofing. Firstly it helps prevent the internal glass surfaces from misting up, secondly it prevents corrosion and thirdly it stops mould from growing on the internal surfaces, something that many of us will have seen on very old pairs of binoculars. Apart from the diopter ring and a few small details, almost the entire exterior on the Trailseeker is has been rubber coated. Whilst it is quite thick, the rubber that they have used is very hard and thus the body does not have as much of a squashy feel about it as some. I personally like this as you do get more of a feeling of quality and whilst it does a better job of protecting the exterior from marking and scratching, you do get a little less impact cushioning with such a hard rubber. This hard rubber is also less tacky than the softer rubber ones and so provides a lot less grip, especially when slightly wet. However Celestron have imprinted a fine texture into the armour which does help a little with this. This fine texture also helps to take the shine off the hard surface a little, which for some like hunters and birders who want or need to remain camouflaged is important. One other advantage of the hard vs soft rubber arm ours is the harder ones tend to last a little longer and not perish as easily. The underside of 8x42 Trailseeker is fairly standard and like many they have included an couple of indented thumb prints. Whilst these are well positioned in that they coax you to hold the bin in the correct way and place so as to get a nice balance, they are not as deep or well moulded as some. From this point of view, you can also clearly see the anchor loops that are used to thread the neck strap through. The ones on these are very secure, indeed unlike some that are glued on, these look like they are part of the main body mould and thus are much stronger. I measured the distance that the objective lenses are set back within the ends of each barrel to be about 10mm. This is a good depth as it offers the lenses some shelter from rain, settling dust and from scratching cause by branches etc. I have also read that this also acts like a camera hood to prevent lens flair. A standard thread which accepts almost all tripod adapters is found by unscrewing the small cap on the front face of the bridge. From here you just screw in the adapter and attach this to your tripod or tripod head depending on your setup. To adjust the distance between the eye-cups to match that of your eyes is very simply done by opening and closing the central hinge and is known as the Inter-Pupillary Distances (IPD) on binoculars. The minimum distance that you can adjust these to is 5.5cm and the maximum is 7.3cm, which is fairly standard and so these will accommodate most people including children and young adults. As with most bins, you adjust the bins focal length by turning the centrally located focus wheel. With a diameter of 3cm, it is perhaps a millimeter or two shy of some, but is close enough to the eyepieces and protrudes up above the bin enough to make reaching and turning it simple enough. This along with the raised track on the rubber exterior also helps with grip which is not that important most of the time, but does make a difference when wearing your winter gloves. Under the rubber, the wheel itself I think is fashioned from plastic, which is pretty much what I'd expect to find in this price range. It looks to be robust enough, without any unwanted movement or play, but like most plastic ones, it just lacks a little something. Turning the wheel is smooth, although when I first took them out of the box, there was a small section that was tighter than the rest, however after some use, this "rough section" went away. To focus from the extremes of near to far (or vise versa) takes about 1¾ revolutions of the wheel (approx 630°). Even though this is still less than some that can take 2 or more full turns, it is about a quarter of a turn more than the majority. This does mean that they have the advantage of making fine adjustments easier, but also means it takes a little longer to make large changes to the focal length. Used when calibrating your binoculars to compensate for any variances between the vision in your left an right eyes, the diopter adjustment is made by turning the ring near the right eye-piece. I would describe the one on this Trailseeker as simple, but functional and on a par with most in their class. The best ones are made from metal, are lockable and have a visible scale or markings that make remembering your setting easier. This one is plastic and whilst you can't lock it, there is just enough resistance to counteract most accidental movement. Should your setting not be neutral or happen to line up with the + or - markings, you can of course quite simply make a mark with a pen or etch with a knife, but it would have been nice and show a good attention to detail if you did not have to. Even though both the focus wheel and diopter ring conform to the standard within their price range, the more important eye-cups most certainly don't and I mean this in a good way - on the whole they are outstanding! To start with the main eye-cup under the rubber covering as well as the eye-piece housing is metal, whereas most of their competitors at this cost will be plastic. 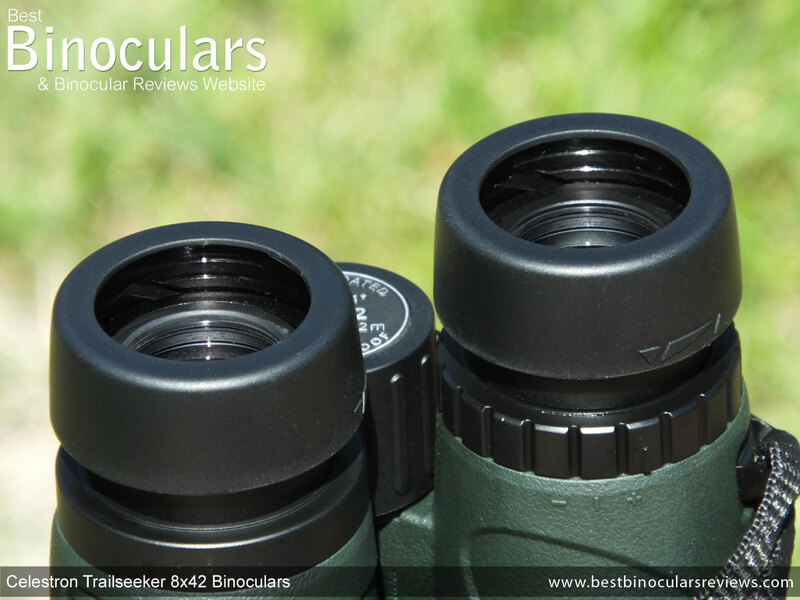 This is more important than you may at first think because this is also the area on a binocular that gets damaged most often and so not only are these far more robust, but the whole twist-up and down mechanism is far superior and without any free play or undesired movement. I love the way as you twist them up and down that they confidently click into the two intermediate stops (four stops in total if you include fully extended and retracted), with a light but reassuringly metallic sound. Each eyecup has a rubber cover and with a large 41mm diameter are about as comfortable as the better ones out there. The 17mm of eye-relief and the two intermediate click stops should mean that most users, even those who wear glasses should have enough flexibility and room to play with to be able to position their eyes at exactly the right distance behind the ocular lenses to get a full view without any dark rings forming on the edges. 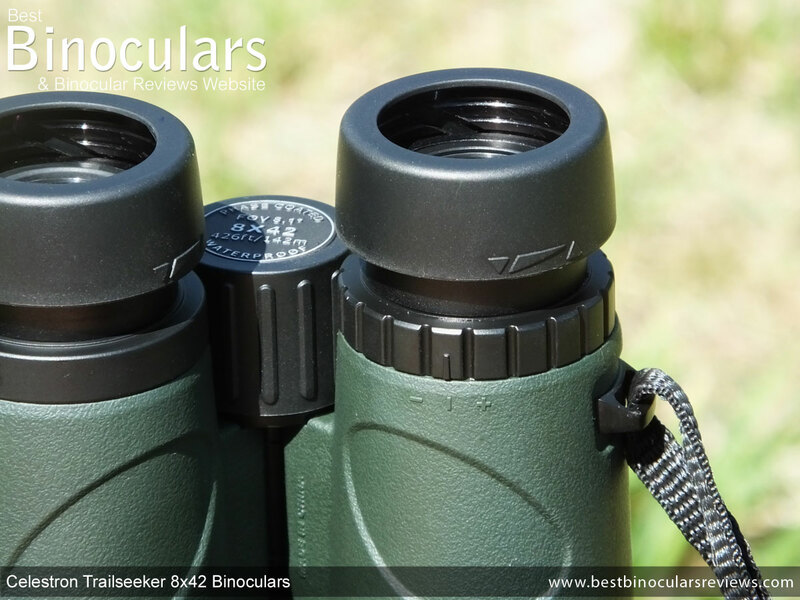 With an advertised weight of 655g / 23.1oz, these are up there with the lightest full sized binoculars that I have reviewed as you can see from the table below. Which if you consider that they have a stronger yet usually heavier magnesium frame than many of those similar in weight to them, makes this even more impressive. Their stated dimensions are as you can see from the table above, pretty standard, if on the smaller, more compact side for bins with objectives of around 42mm. 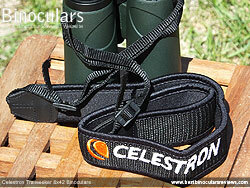 Celestron's published length of 5.5in (14cm) is achieved with the eye-cups twisted in and removing the lens covers. By twisting out the cups, I measured the length at 14.8cm and then with both the objective and eye-cup covers on it moves out to 15.4cm - which for a bin in this size class is still nice and compact. Their stated width of 5.1in (13cm) with the central hinge fully open, close this and it drops down to 11.5cm. Likewise, the height of 2in (5.1cm) is measured with the central hinge open, but without their lens covers off. The hinge that connects the cover to the ring and the small tab on these add quite a bit to the height and so if you include this, their height is actually 6.5cm. Also if you fold the binoculars, their height increases to 7.5cm with the lens covers included. All of which are fairly standard. To get the individual wavelengths of light to bend and behave in the exact way desired in order to get the best possible image, almost all modern binocular lenses are made from multiple pieces of glass that have different optical properties and that are very precisely shaped and then stuck together. However almost all bino manufacturers omit supplying much or indeed any details as to the makeup of the lenses, both in the eyepieces and the large objectives and unfortunately I have to say that Celestron are no different in this regard, which is a real shame. So all I can say is that the ocular lenses on the 8x42 Trailseeker are 23mm wide, which puts them on a par with some of the biggest used on full sized bins and the large lenses or objectives have a diameter of 42mm as is expressed in their name. 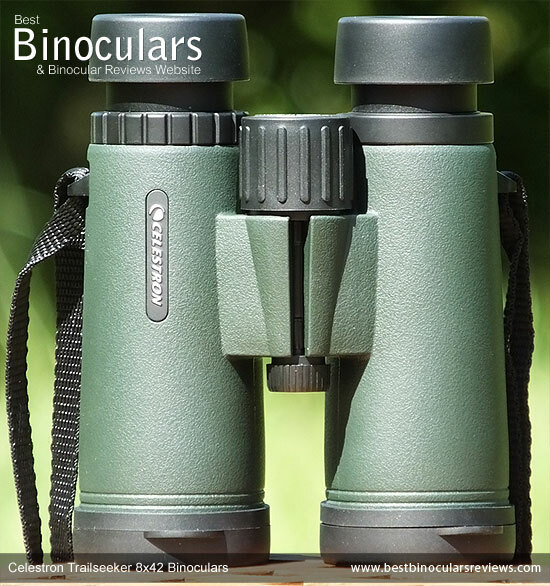 This is the most commonly used size for a full size binocular as they provide plenty of surface area to collect light, yet are not so large as to make the device too big and heavy. What I can say is that because they don't shout about it, the objectives almost certainly do not contain ED (extra-low dispersion ) glass elements. 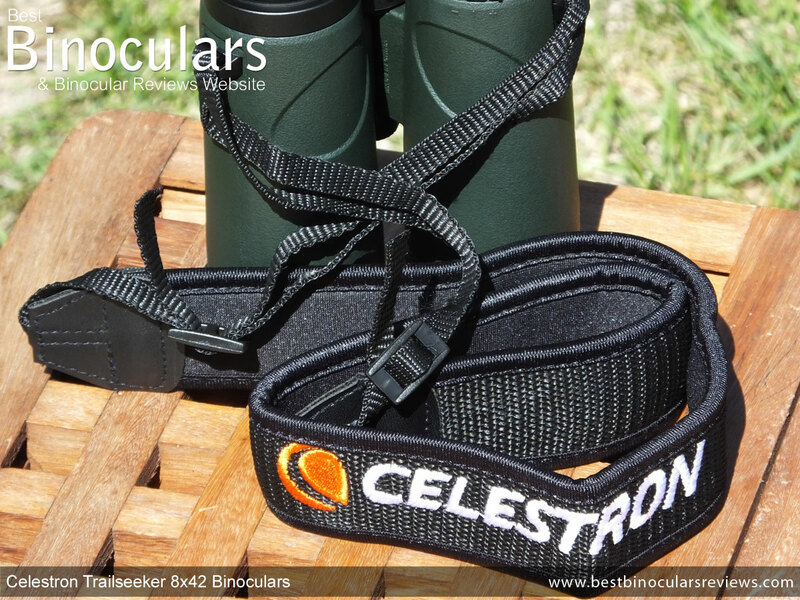 This is the only area within the optical system of these Celestron binoculars that does not quite match that of more costly products and this is obviously where Celestron have decided to save costs and thus keep the price down on these. However for a lower cost bino, this could actually be a really smart move as those that do use ED glass are not actually guaranteed to produce an image that is instantly better than those that don't. Let me explain: The extra-low dispersion properties within ED glass only give the designer of the optical system more options to help them direct the wavelengths of light and they still need to be designed very cleverly to make maximum use of this added flexibility. This is not always the case and I have seen quite a few really well made non ED bins produce an image with less color fringing (cause by chromatic aberrations) than some less well made ones that do. As you can read about in the section on their Image Quality below, these do perform pretty well in this area and whilst they might not match that of the very best that almost completely eliminate color fringing, the amount that is visible is minimal and no more than what I quite often see looking through many mid ranging ED bins. The Celestron Trailseeker's use roof prisms inside the binocular to invert the image, so we see it the right way up after it has passed through the lenses. This design of prism is very popular because unlike the more traditional porro prism, the way they light passes through them in a straight line, means the designers can make a more streamlined binocular with the eyepieces in-line with the objective lenses. Celestron indicate that the prisms are fashioned from BaK-4 glass, which I reckon, like the vast majority of bins out there, will be the BAK4 glass made from a Phosphate crown and not the more expensive Barium crown ones made by Schott that are only really found on some very high end optics. This Phosphate crown glass has slightly different refractive and dispersive properties as well as usually having a higher bubble count than the Schott Barium crown glass, but is still of a really good quality and for the use in this type of binocular considered much better than the BK-7 glass that you sometimes see in lower priced binoculars. The first thing to note is that these Celestron binoculars are "Fully Multi-Coated" which is excellent. The exact wording here is very important, because unlike the cheaper and much lower quality "Multi-Coated" or "Fully Coated" optics, these have had numerous layers of a special anti-reflection material added to ALL the exterior glass surfaces throughout the whole optical system. Whereas lesser quality optics that are only Multi-Coated only have these coatings added to some of the surfaces and Fully Coated only have a single layer applied as opposed to many on these. The amount and quality of these coatings makes a big difference to the way the light behaves as it comes into contact with each lens surface, with untreated lenses either reflecting away a large proportion of it, which vastly reduces the transmittance levels and thus producing a lower quality and dimmer view. Manufacturers can add a highly reflective material to the surface on the roof prism that does not reflect all the light that strikes it. This is a very specialized process and depending on which type of coatings used can vastly increase the reflectivity of this surface and thus improve the transmittance levels. However they are not all created equal and to save costs, many will use cheaper materials that have a lower reflectivity. Within this price range it is not uncommon to find roof prisms with the cheapest option of an aluminium mirror coating that will transmit between 87 and 93% of the light. More common within this price bracket are silver coated prisms that cost more to make, but can reflect up to 98% of the light. What is uncommon to see within this price bracket, but is what Celestron have used on these Trailseeker's are dielectric coated prisms. These have a reflectivity of more than 99%, but because of the difficulty in producing them and the costs involved they are usually reserved for the top tier, "alpha" bins and so it is a very welcomed surprise to see them used on these. Particular to roof prisms and left untreated, the lightwaves that pass through it will come out the other side slightly out of phase with each other, which results in a lower resolution image that also has less contrast. Once again and within this price level to save on manufacturing costs, it is not that uncommon to find roof prism bins that do nothing to correct this. However better quality optics, like these Celestron Trailseeker 8x42 binoculars have coatings of a phase correcting material applied to the prisms which eliminate this problem. As this table clearly shows, these Celestron's are up there with the cheapest to have Fully Multi-Coated optics and the addition of Phase Correction and Dielectric coatings on the prisms is very impressive. Indeed apart from not using ED glass lenses, these match the very best when considering their optical features and they punch way above their price point. 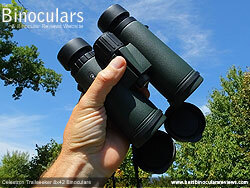 For many, especially birders, the most important optical stat to look out for is their field of view (FOV). In simple terms, this is a measure of how wide (or how high) the image you can see through the binocular is at a certain distance away. Obviously the bigger the image, the more you can see at once without having to move the view and thus it makes it easier to find what you are looking for. It also makes it easier to follow faster moving objects, like birds or example. These Celestron Trailseeker 8x42 binoculars have a FOV that is 426ft wide at a distance of 1,000 yards (142m at 1,000 meters). Or to express it as an angle from the binocular, they have a viewing angle of 8.1°. 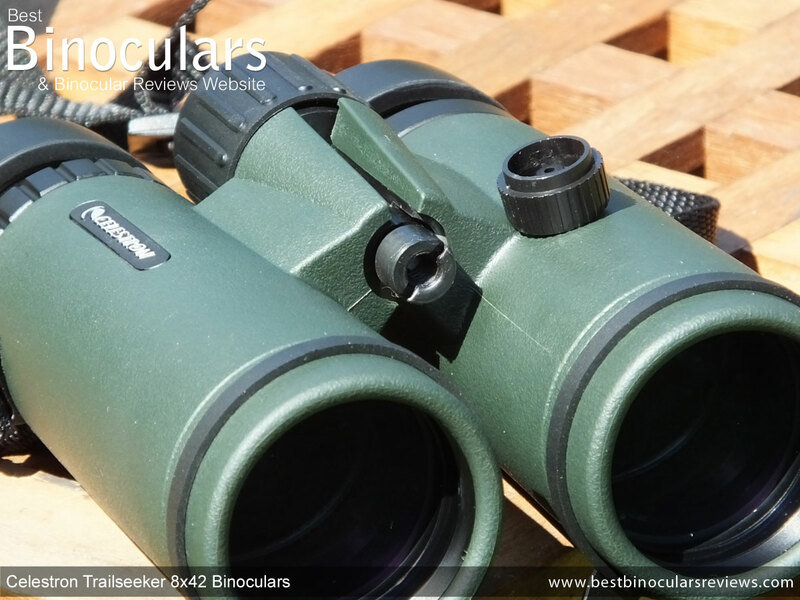 As you can see from the table comparing other 8x42 binoculars that I have reviewed below, this FOV is extremely wide and places them up there with the very, very best. This will bring a huge smile to many price conscious birders out there, indeed as you can also see below they have the exact same stats as the far more expensive Celestron Granites, which won my award for the Best Birding Binocular in 2012, which they won largely because of their superb view and also because of their incredible optical stats. Once thing to remember about optics, is that it is all about compromises and getting the right balance and as you make a bin strong in one area, you loose out in another. S whilst their FOV is sensational, their eye-relief is good, but at 17mm is not what I would call excellent. Eye-relief is the distance at which your eyes need to be behind the ocular lenses to see the full view. The eyecups on the bin are designed to ensure that for most people, once they are fully twisted out and you rest your face against them you are at this exact distance. However not everybody's face is the same and there are of course people who wear glasses and thus may need to change the setting on the eyecups to suit their needs. Eyeglass wearers in particular often look for a good amount of Eye-relief to ensure that they have plenty of room to manoeuver to be able to keep their glasses on and still get the full view. What is more and as we already covered when talking about the eye-cups, the two fixed intermediate click stops will also help those eyeglass wearers get the right setting for their particular needs. Most people use their bins to look at objects far off in the distance, however there are occasions when you may find that you want to get a much better view of something nearby. For example a bird settles on a branch near you, or if you want to observe an insect in great detail. Indeed there are specifically designed very close focus bins like the excellent Pentax Papilio 8.5x21 binoculars that accommodate those who do this a lot. 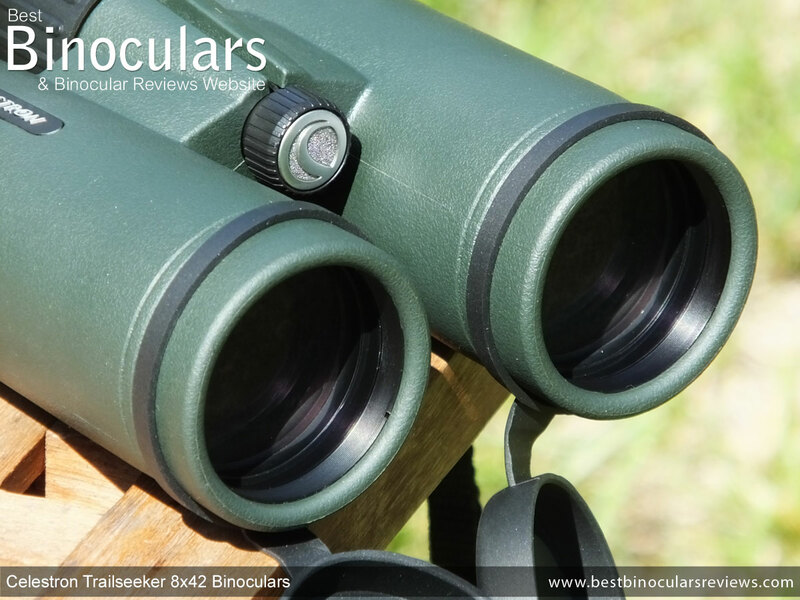 For most people though being able to occasionally get a good close view is enough and for an all round 8x42 binocular like these, I rate anything under 6ft as being excellent. So with an advertised close focus of 6.5ft (1.98m), these Celestron Trailseeker's are still very good and more than fine for most of us. However I measured the closest distance I could focus with the pair that was sent to me for reviewing to a much closer 4.6ft (1.40m), which is superb and I can only guess that they publish the official minimum focus as being much longer to be on the safe side? Combining 42mm lenses with an 8x magnification is the most commonly used setup on all bins. There are a number of really good reasons for this, but one of the most important is the fact that they have a 5.25mm wide exit-pupil (42 � 8 = 5.25), or to put it another way: the shaft of light that exits the ocular lens is about 5.25mm in diameter. This is important because it shows us that the amount of light that they deliver is for the most part, more than what our eyes need and so the image you see will look nice and bright. I can say this because in all but the very poorest light conditions, the pupils in your eyes will be smaller than the shaft of light coming from the binocular and so they will be supplying your eyes with more than enough light. The most difficult part of every review that I write is the image quality section, which has to be said is probably also the most important part! The reason for this is that what you see through a bin can be very subjective and indeed can change depending on current conditions. 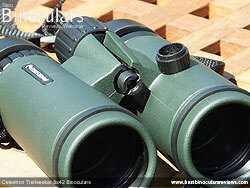 Also the differences between some binoculars or something pertaining to a particular aspect of the view can be minute. This means at times you are convinced you can see it and there is a difference, then later on and in different conditions you can't and there is no difference! 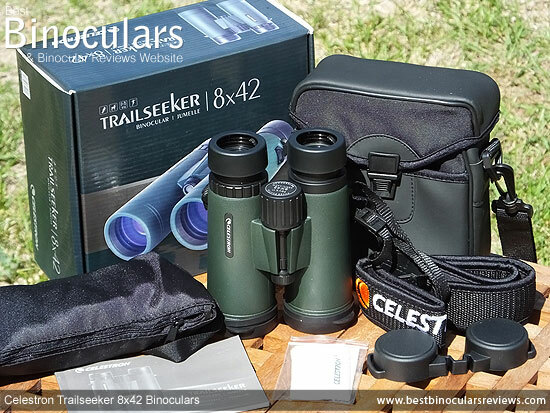 As with all 8x42 binoculars, these Celestron Trailseeker's have an Exit Pupil of 5.25mm (42÷8), so it is no surprise that as long as the optics are of a good standard (which we have already seen, these most certainly are) that in bright conditions, where the bins supply your eyes with more than enough light, image brightness was very good and matches that to what you see without binoculars. It is in bad light where things can sometimes get interesting and bins with more/better quality optics and coatings sometimes come to the fore. Here I thought that these were about equal to my benchmarks and try as I might, I really struggled to observe one as being obviously different to the other. So this leads me to rate these as very good to excellent in this particular aspect of the view and most certainly up there with the best within their price range. Here I look to see if I can spot any obvious tinting of the image that you sometimes see, especially where cheaper glass is used. Thankfully this is most certainly not the case on these Celestron 8x42 Trailseeker binoculars and to me the image looks nice and natural and apart from the added magnification, no different to my view without them. Likewise there is a nice contrast between dark and light, unlike the rather flat washed out view you can sometimes get. The amount of contrast on these looks normal and gives a nice sense of depth and makes objects stand out nicely. As I spoke about earlier in the optics section above, many bins these days have an element within their lenses that is made from a glass that has special extra low dispersion properties, which if used correctly in a well designed optical system can help to lessen or even remove the chromatic aberrations that cause color fringing that you sometimes see around highly contrasting objects in the view. These bins do not use ED glass, however this does not automatically mean that they will show a lot or more color fringing than those that do, it all depends on how well they have designed the lenses and the rest of the optical system to direct the individual wavelengths of light. So what did I see: Well, like most bins (including many who use ED glass) I could see some fringing, but only by looking really hard for it. The amount is minimal and to be honest unless you are actually looking for it, for the most part it is not at all easily seen. Whilst it is true to say that my high end benchmarks were better and the thin halo that you see was smaller, it was only by a small amount. Thus I would say that the fringing on these is very minimal and no worse than I would expect to see within this class. There are two types of distortions known as "pin-cushioning" and "barreling", which can make the image you see look like it is either curving inwards or outwards respectively. 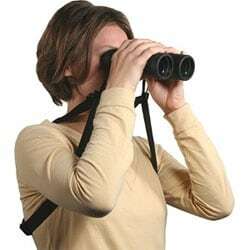 I could not see any signs of this when looking through these Celestron Trailseeker binoculars. Whilst there is some blurring of the image right along the edge of the view, it is negligible and no more than the best in their class. I can describe the view through the Celestron Trailseeker 8x42 binoculars as being very good on the whole and exceptional within their price bracket. The included carry bag looks to be very similar, if not identical to the ones supplied with Celestron's much more expensive Granite models which is great. The materials and the stitching look to be very good and I like look and feel of the contrast between the nylon and what feels like Neoprene panels. The very close weave on the nylon and the waterproof Neoprene panels also mean that whilst not completely impervious to water, this soft carry case will perform as a very effective barrier against all but the heaviest rain. For a soft case, the amount of padding is very good and thus it will protect your bins from impacts as well as the best I have used, with only completely rigid or semi-rigid cases being better. The bag comes with it's own shoulder strap, which is un-padded and connects to the bag via a couple of quick-release clips on each side. These clips are swivelled and thus enable more freedom of movement and I guess make it easier to untwist the strap should you need to. There is also a belt loop located on the rear of the bag, meaning that you can attach and carry the bag on your hip after quickly removing the shoulder strap with the quick release clips. A fold over lid on the top of the case gains you access to your bins inside. This flap is fastened using a small plastic quick release press down clip, which not only makes it secure, but quicker and easier to open and close as well as make less noise when doing so than some that use Velcro or a Zips. I certain instances where people like security personnel, birders or hunters need to be stealthy and perhaps not startle wildlife this can a be a small but important consideration. On the down side, a single fastening point does not offer a complete seal as long Zip or piece of Velcro does. On the inside front of the bag is a quite large separate pocket, which is an ideal location for storing your cleaning cloth, keys, money etc. Whilst the fit is what I would describe as very snug, it is not too tight and you can still just close and fasten the lid with the eyecups fully extended, the rain guard and lens covers on and with the neck strap stashed in the bag as well. Believe it or not, this is something that often gets overlooked and for me there is nothing more frustrating than having to struggle as well as twist in the eye-cups every time I want to replace my bins in the bag. Once again, the included neck strap looks to be the same as that you get with more expensive Celestron models - score! The padded section is well padded (4mm deep) and has what looks like a Neoprene underside that offers a smooth comfortable surface that wont easily crease or fold which can make for an uncomfortable point on your shoulders or neck. It is slightly curved to better follow the path around your shoulders and is a full 4.2cm wide and thus has large surface area to spread the load and increase comfort even further. The stitching on the faux leather connectors that join the padded section to the thin nylon straps looks good and should hold firm. 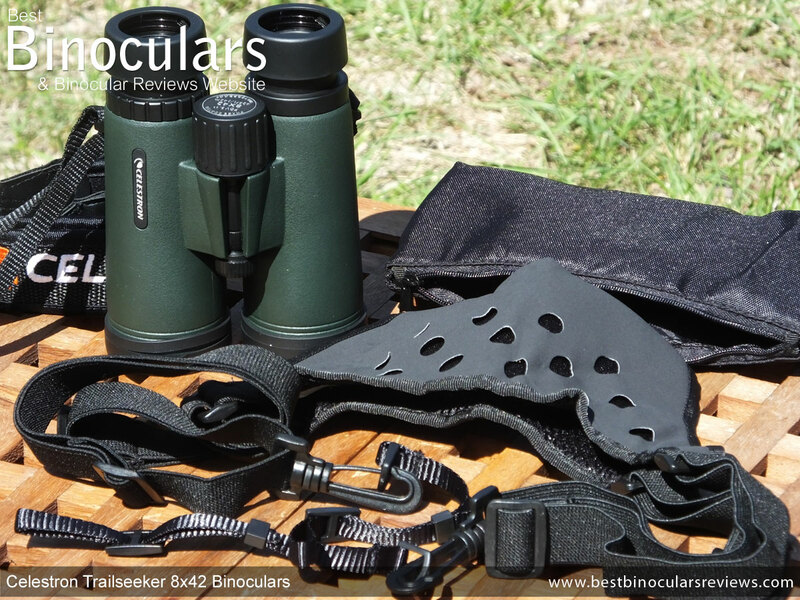 The thin nylon straps thread through the loops on the sides of the binocular in the usual way and then connect back on themselves via a couple of plastic sliders that enable you to adjust the length of the neck strap to your liking. Whilst you expect to get a neck strap and carry case with your bins, the inclusion of a binocular harness is a very welcomed, but completely unexpected addition. Sometimes referred to as binocular suspenders because of the way two of the straps go over your shoulders, but instead of holding up your pants, these are designed to take the weight off your shoulders and keep your bins close to your chest when not in use, but always close at hand and easy to get at for when you do need them. However for me one of the biggest advantages of using a bino harness is that you have your optics close to your body and no longer have them swinging from around your neck. This can sometimes not only be annoying, but you have more of a chance damaged your bins as they swing and bang into a rock when traversing steep hills or getting snagged and caught up when making your way through thick undergrowth. The included Celestron harness comes in it's own small zipped storage pouch which is great for storing them away when not in use. It also has an attached wrist strap and so also makes it easy to carry about. The harness itself looks well made, with good quality stitching. The elasticated straps have sliders so that you can adjust their lengths to suit your body and fit onto the main back panel via some plastic loops, which allow for more freedom of movement. The main back panel is quite large and pretty well padded, which are both great for spreading out the load to make caring the wight on your front more comfortable, but does make for a larger area on your back that will get hot and sweaty. To help with this, there are a number of small circular air vents and the underside is made from a very breathable material with a very open weave. The harness connects to the binoculars in the same place and way as your neck-strap with a couple of cords that loop back on themselves after being threaded through the small rings located on the side of each barrel on the bin. These cords are attached to the harness with a swivelled quick release connector, which means you can quickly and easily detach your bins from the harness should you wish by simply unclasping them. I have used this same harness before as it is also included with the Celestron Granite 8x42 binoculars that I reviewed a while back, so knew from the last test that it would be comfortable to use and once again it was. Once you have correctly adjusted the length of the elasticated straps when on your body, they have enough tension to keep your bins from moving too much on your front, but at the same time, there is not too much tension as to make it difficult to lift the binoculars up to your eyes. Indeed this tension can actually help you keep the image a little steadier as it lightly pushes the bins back into your face, for a more secure anchor point. On the whole and on longer walks, I really enjoyed using these. For uses like around the garden etc, the neck strap is a better option, so it is nice to have the choice. I just wish that Celestron design the neck strap with quick release clips, which would make swapping between the two much quicker than having to re-thread the straps onto the bin every time. Made from a flexible and soft plastic or rubber, the Trailseeker's lens covers fit over the ends of each barrel. Whilst the fit is good, meaning they are easy to take off and replace, yet wont come away too easily by accident, I do prefer the classier as well as sleeker look of lens covers like that which come with the Celestron Granite that fit into, rather than over the ends of the barrels. They also have a small tab on the top, which once again do nothing for their looks but do make them even easier to quickly flip off. Each cover also has a rubber loop that fits around the barrel and allows them to simply hang below the bin when you are looking through the optics, but are always at hand to replace when you are done. This may seem like a small thing, but I can tell you from experience that not only are loose lens covers a pain to find all the time but are also very easily lost. This way it makes it no trouble to replace them EVERY time, which in turn means your lenses not only always remain protected, but stay cleaner for longer, thus requiring less cleaning and therefore helps ensure your optics remain in pristine condition for longer. The soft rubber eye-piece cover or rain-guard is very typical in that it has two cups that fit over the ends of the eye-cups on the bin and which have a bridge that joins them together. Made from a soft plastic/rubber, like the objective lens covers, the fit is good and the bridge is nice and flexible, meaning that they can be easily replaced onto the eye-cups whatever you inter-pupillary position is. Each cup also has a loop on the side of it, which is designed so that the neck strap can be threaded through and thus keep them close at hand at all times should you wish. The included cleaning cloth is of a good quality and I would say better than most at this price range, making them ideal for emergency cleaning out in the field etc. However I would still suggest that you invest in a specialized lens cleaning kit for the proper cleaning of your lenses and to make sure you don't scratch or damage the exterior lens coatings. Celestron include a somewhat basic and generic instruction booklet, that contains the usual information on the parts of the bin, how to adjust and care for them. Also included is the information on the excellent Celestron "Limited Lifetime Warranty" which indicates they will cover any need repairs or indeed replace these binos should any parts be defective or should they get damaged from normal wear and tear. Once again for a product in this price point, this is excellent. 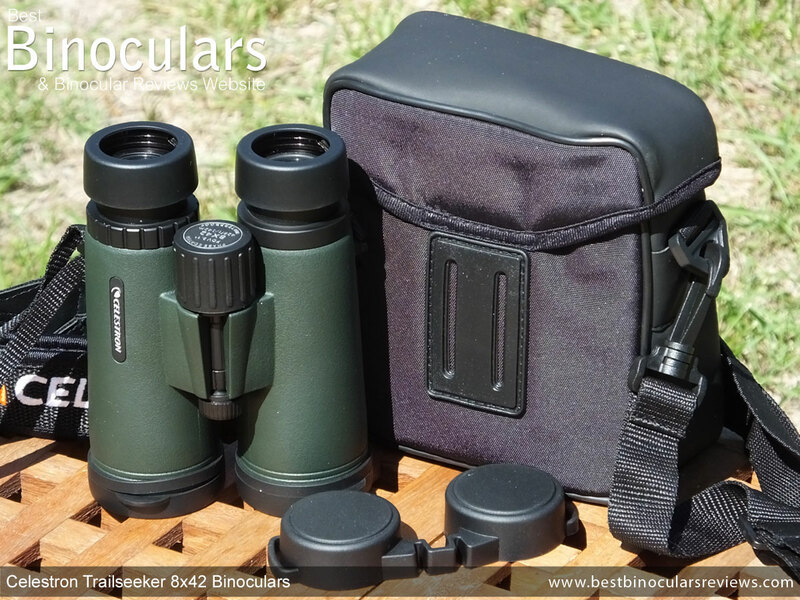 I think the table below that compares a number of similar 8x42 binoculars is very revealing: If you notice, I have also included the more costly Celestron Granite binoculars, that apart from the price difference and the addition of ED glass, have very similar specifications, which like these Trailseeker's are all very impressive. Strong Points: The extremely wide field of view you get through the Celestron Trailseeker 8x42 binocular is really hard to beat and is thus a real highlight of these. This combined with their very good quality glass and almost unbeatable coatings that combine together to produce a high quality view that is way better than what their price tag suggests and is thus absolutely something that is worth highlighting and another real strong point. Many bins at this level will, like these also be very lightweight, but that is because they use cheaper and lesser quality plastic bodies and components. So the use of a magnesium body and their all metal eye-pieces are definite signs of quality and like the coatings, not something that I often see at this price point. In general the quality of all the accessories is better than that which you find supplied by their direct competitors, indeed they match many that are far more expensive. 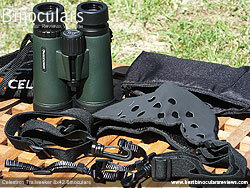 Add to this a lifetime warranty and the inclusion of a binocular harness, it is really impressive. Weak points? Whilst the rubber armour itself is good, I did think that it would be better had it been attached to the body underneath a little more securely. Don't get me wrong, it will not come away or move under normal conditions, but you can pull it up from places like the ends of the barrels a little easier than the best. Whilst not bad, the plastic focus wheel does not quite match the quality of the metal eye-pieces, which are a real strong point. Having said that in their class, I cant think of any that have metal focus wheels, so this is possibly a little harsh. However when I first used the bins, I also had a section that was a fraction tighter when turning the wheel than the rest of the time. This did go away after a little use and I suspect this may have been just a once off, but it does show the difference in quality of the focus mechanism that you get between many cheaper bins like these and the very best. Overall - Celestron have certainly done their homework with these and as you can see above, for such a cheap binocular, the weak points are very minor and the list of strong points is quite long and substantial, which is impressive. Indeed I am still amazed that they have managed to include so many high end features, components and coatings into this product. 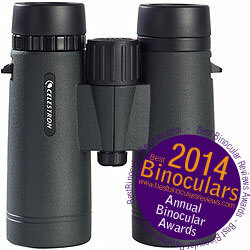 Is this Trailseeker as good as more expensive ones like their excellent Celestron Granite binoculars? No, but they are not that far off in most areas and so I can highly recommend these to anyone who wants good all-round, but low cost optics. Great Value For Money? 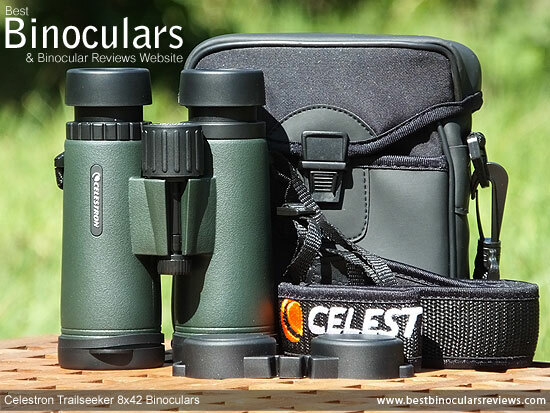 - Most certainly, these Celestron Trailseeker binoculars come with a host of features and components that work together to offer a level of performance that easily surpasses their price tag and thus as a result passes almost all of their direct competition making them one of the Best Value For Money Binoculars in their class. 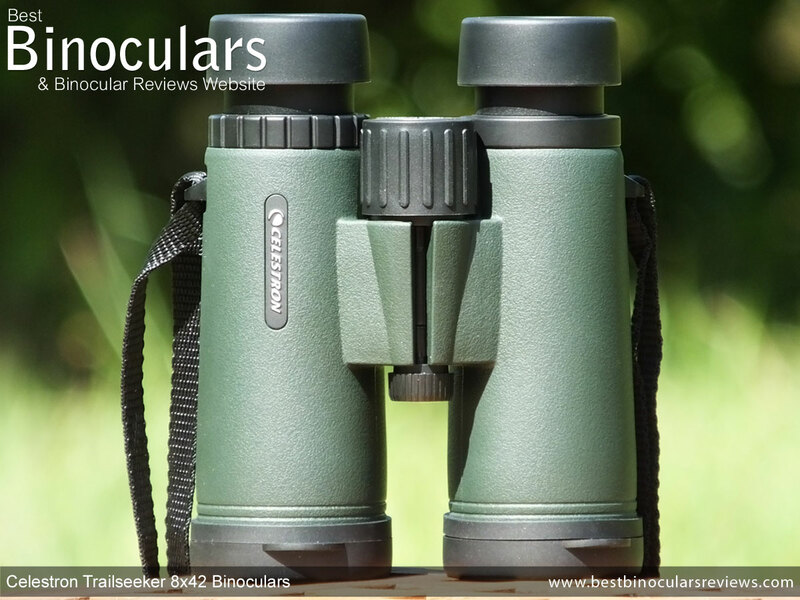 Ideal Uses: Their very good image quality and low light performance as well as their exceptionally wide viewing angle makes them ideally suited to most wildlife and bird watching pursuits. 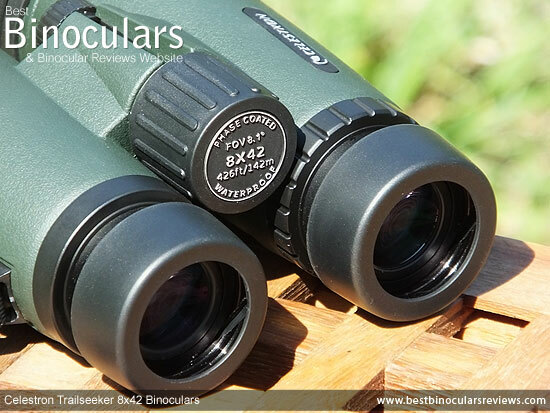 As a low cost, general use binocular, these will be hard to beat and if you factor into the equation that they have a strong and lightweight magnesium body, are waterproof as well as fog proof, then you have a binocular that will not only survive, but perform well on most hunting trips. For uses like safaris and sporing events these will perform really well once there, especially considering the wide FOV, but some may prefer an even more compact product that is easier to pack and carry in a bag. In this case I would suggest looking at the 10x32 or 8x32 Trailseeker models. I have come across many so called reviews on the web that are little more than adverts or copies of the manufacturers information, written by someone who has never seen the product, which really annoys me. I would like to assure you that this review was written after I fully tested the Celestron Trailseeker 8x42 binoculars and is my honest opinion of it. The facts and figures are those that were supplied to me or that I have researched on the web and I believe them to be true, however sometimes mistakes are made, so if you spot any please drop me a line to let me know so that I can make the necessary corrections.